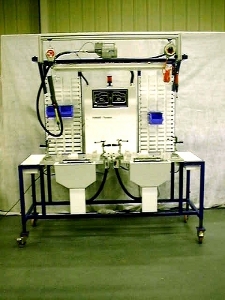 The photograph shows an assembly bench designed to fit into a assembly line and has part verification, torque unit with data feedback and turntable/lift to aid assembly. 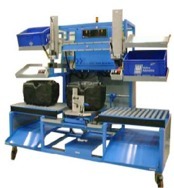 Free standing benches are also available with component tooling, overhead tool hanger, lighting, component grab bins etc. Plastic glove box assembly bench with led light board. For each assembly action, the tool that's used is monitored. Once a particular stage has been done, feedback is given a PLC. The part is not released until all operations have been completed, indicated by all leds being extinguished.